The Indiana Hoosiers and Michigan Wolverines will battle for Sunday’s Big Ten Tournament title after dispatching Maryland and Wisconsin, respectively, in the semifinals on Friday. Indiana, the number one seed, tied Friday’s early game 1-1 in regular time, advancing 4-3 on penalty kicks. 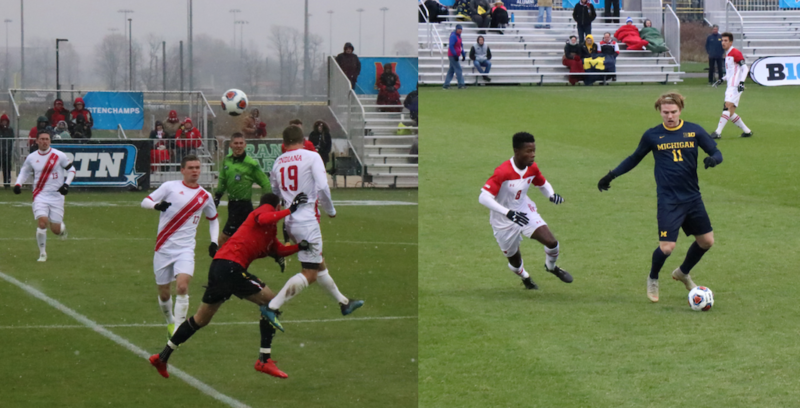 In the other semifinal, an early penalty kick for Michigan proved to be the only goal of the game in a 1-0 victory. The Hoosiers and Wolverines last played on October 7, with Indiana winning a crucial road game 1-0 on a Rece Buckmaster goal. But Friday, it was Buckmaster’s defensive counterpart, senior Andrew Gutman, who stole the show. Gutman scored Indiana’s lone goal of the day after an incredible individual display of skill gave the Hoosiers a 1-0 lead. Gutman dribbled through almost eight defenders on his way to his 10th goal of the season. After the game, Gutman said that irrespective of the opponent Sunday, Indiana needed to focus on one team – itself. Head Coach Todd Yeagley – voted Big Ten Coach of the Year before the start of the tournament, said that his side definitely controlled the game against Maryland, and will look to do more of the same against Michigan. The Hoosiers will enter Sunday’s match with one of the hottest teams in the country, after winning all 10 games against Big Ten opposition this season. Indiana boasts four first team All-Big Ten players and is unbeaten in the last 37 regular season matches against Big Ten opponents. But even though the Hoosiers haven’t lost a Big Ten match since 2015, the last time they won the Big Ten Tournament was 2013. Additionally, out of the three games this season where Indiana failed to score first, the Hoosiers only won once. On the flip side, Indiana is now 15-0-1 when scoring first this season. Their opponent, the University of Michigan Wolverines, boasts an equally impressive record when it comes to scoring first. The Wolverines are now 12-0-0 when notching the first goal, meaning that Sunday’s final will almost certainly come down to who scores first. Michigan last won the Big Ten Tournament title in 2010 and finished the regular season in third place, behind only Indiana and Wisconsin. The maize and blue are headlined by two prolific attackers – junior Jack Hallahan and sophomore Umar Farouk Osman. Hallahan was voted first team All-Big Ten with eight goals and eight assists, while Osman was a second team All-Big Ten player with nine goals and three assists. Having upset the Wisconsin Badgers, the Wolverines will try to do what no Big Ten team has done this season – beat the Indiana Hoosiers. Head Coach Chaka Daley recognizes that winning is a challenge. Yet, if any team can do it, it’s his, he said. A Michigan win on Sunday would be somewhat of a surprise. As referenced earlier, Michigan lost its only game against the Hoosiers this season and hasn’t beaten the Hoosiers since 2013. Additionally, Michigan is 0-2-1 against ranked opponents this season. That said, Michigan is coming off a game where it allowed zero shots on goal and severely limited Wisconsin’s chances. Daley added that a win on Sunday will start with the back four, and the defense will need to replicate the performance it produced Friday. Michigan’s defense enters Sunday’s match with an outstanding defensive record. The Wolverines have allowed only the second fewest goals in Big Ten play this season. The team that allowed the fewest? Indiana. An Indiana win on Sunday will be the side’s 13th Big Ten Tournament title, while a win for Michigan will represent the Wolverines’ second tournament title. Fans can catch the Big Ten Tournament final Sunday at noon eastern time on Big Ten Network and BTN2Go. Previous PostMidterm elections see increase in pro-choice members of Congress from IllinoisNext PostDid Sean Casten run as an environmentalist? Yes. Is that why he won? Maybe.